Here are the facts. The proficiency exam is not a recertification exam. This is to measure your ICD-10 proficiency. You will have between October 1 2012 until September 30, 2014 to successfully complete your proficiency exam to maintain certification. It is true every certified coder must take this exam. It is online, timed, and you can use any resource at your disposal. Does this sound like a certification exam? I think not. There is no certification for ICD-10. The cost will be less than paying to earn CEU's. Now keep in mind, AHIMA will not offer the education for free. There is a charge. If you compare AAPC's costs for webinars, workshops, conferences, etc, you will see that our costs are much lower. For example if you are an AHIMA member the webinar price currently for some webinars range from $179 to $229. Who knows what the costs will be in 2013. If you want to take the AHIMA course now it is very expensive and even if you are a trainer planning to train on ICD-10 it is not time to start training yet. The codes are still in draft format as well as the guidelines. We should be working on Implementation right now. I encourage all of you to begin thinking more about what we need to do to get ready than the coding. It is more than a systems or software upgrade. I encourage all of you to read every article you can on ICD-10. AHIMA does have some good resources and so does AAPC. Go to the CMS website and read information on their website. There web address is http://www.cms.hhs.gov/ICD10. Lastly in April AAPC along with sponsorship from CMS is offering a code-a-thon on ICD-10. This will be the forum to get your questions answered by the experts. We don't have a date yet, but it will be held after the AAPC conference in late April. We will post the date on the AAPC website and the ICD-10 forum when more information is available. ICD-10 Will Change Everything. Will You Be Ready? I took a look on that awhile ago because I want to be one of the early ICD10 certified in hopes of boosting my job seeking prospect. You have to have coding or teaching experience to be qualified right? That's not for CPC-As like me. Or is it open even for inexperienced now? Because I will take it. 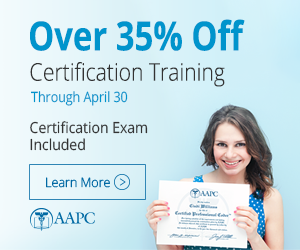 I have already taken the recertification online through AAPC. It is only $60 and has 75 questions. They give you 3.5 hours and it took me 1.5 hours to complete. I used my online coder with the ICD-10 function which was much faster than tabbing through the book and flew right through it. There were no questions about guidelines; it was all straight coding. If you are an experienced coder, this will not be difficult. Once you know how to use the book, or the online ICD-10 coder software, you will breeze right through this. I am surprised that the test does not have any questions on the guidelines since that is what diagnosis coding is all about. Could I ask what do you mean by online coder?